Malvinder "forged the signatures" of Aditi Singh, Shivinder's wife, in the documents of RHC Holdings Pvt Ltd, which along with Oscar Investments Ltd jointly owned financial services firm Religare Enterprises Ltd and hospital chain Fortis Healthcare Ltd, the petition said. Former Fortis Healthcare promoter Shivinder Mohan Singh has alleged that his elder brother Malvinder forged his wife's signature, perpetrated illegal financial transactions and led the company into an unsustainable debt trap. In a petition filed before the New Delhi-bench of the National Company Law Tribunal (NCLT), the younger of the Singh siblings, who were synonymous with each other for decades, sued Malvinder for "oppression and mismanagement" of their companies. The petition, which is likely to come up for hearing on Thursday, charges Malvinder, 45, and former chairman of Religare Enterprises Ltd Sunil Godhwani of putting the company in a debt trap and acting prejudicially to the interest of its creditors and shareholders. Malvinder "forged the signatures" of Aditi Singh, Shivinder's wife, in the documents of RHC Holdings Pvt Ltd, which along with Oscar Investments Ltd jointly owned financial services firm Religare Enterprises Ltd and hospital chain Fortis Healthcare Ltd, it said. Malvinder and Godhwani "used their respective positions to perpetrate or cause others to perpetrate illegal financial transactions and various acts of mismanagement by and through RHC, leading to massive losses to RHC and its subsidiaries, and a depletion of the wealth," the petition said. Their mismanagement put the company "into an unsustainable debt trap," it said. 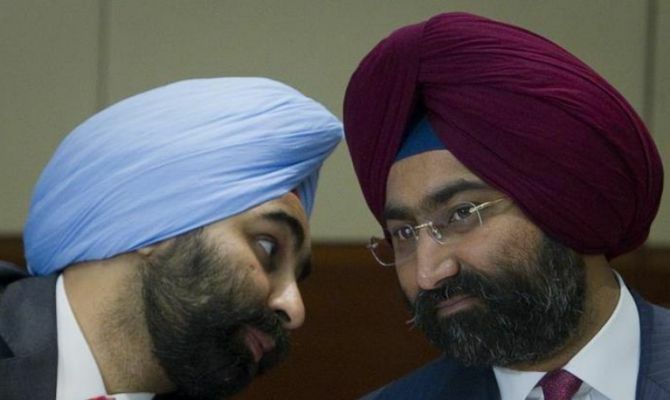 Shivinder, whose public shareholding along with that of his elder brother was seized by lenders, besides being probed for illegal withdrawal of funds from Fortis Healthcare, wanted NCLT to remove Malvinder and reconstitute the board of RHC. He asked NCLT to declare that Malvinder and Godhwani caused grave prejudice to the interest of the company by acting in "collusion with each other". He also requested NCLT to "direct Malvinder Mohan Singh and Respondent No. 4 (Sunil Godhwani) to restitute the undue gains made by themselves, which lead to losses being suffered by the petitioners and RHC Holdings". Shivinder has also petitioned NCLT to direct Malvinder and Godhwani to "restitute and restore the wealth of RHC Holdings which got eroded due to their unlawful actions" and disclose "their assets, bank accounts and net worth". The petition filed through law firm RRG & Associates also asked NCLT to direct Malvinder "to return the funds unlawfully taken from Fortis Healthcare and Religare Enterprises". When contacted, RRG & Associates managing partner Ranjana Roy Gawai refused to comment, saying the "matter is subjudice and proprietary demands that we should await the outcome..."
Malvinder Singh could not be reached despite repeated attempts. Shivinder also requested NCLT to direct Malvinder and Godhwani "not to alienate any interest in any asset anywhere so that recoveries can be effected against them". While seeking interim relief, Shivinder has sought an injunction "to maintain status quo as on filing of the present Petition" over the shareholding of RHC Holdings till the time of disposal of the matter. He has also sought "status quo to be maintained on board of directors" of RHC Holdings in his petition filed under section 241, 241 and 244 of the Companies Act, 2013. In his 43-page petition, Shivinder alleged that signature of his wife Aditi Singh, who had held the post of managing director of RHC Holdings, was forged. "There are also instances of the petitioner No 3 (Aditi Singh) being shown as present for a board meeting when she was in fact abroad. "A resolution of the board of the company dated September 25, 2014, demonstrates the presence of petitioner No 3 in the board meeting, while in fact she was out of the country from September 24, 2014, till September 28, 2014... ," he said. Shivinder further said: "Aditi Singh merely held the post of managing director on paper and had no role to play in the day to day workings of the company...has always been a homemaker who played no part in the functioning of RHC Holdings." RHC Holding Pvt Ltd is a non-banking financial company owned by the families of Singh brothers. Currently, Malvinder Singh is the managing director of the firm. Will RBI hike rates in October?